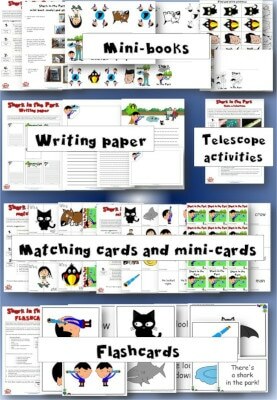 Shark in the Park is the fun story of a boy playing in the park with his telescope. “He looks at the sky. He looks at the ground. He looks left and right. He looks all around. 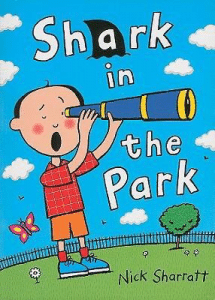 And this is what he sees….THERE’S A SHARK IN THE PARK!” Of course, there isn’t really a shark. Or is there?! Apart from typical things you see in a park, this story is also good for prepositions and complete sentences with ‘There is / There are’. 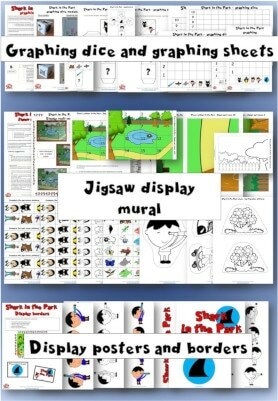 Best of all, it lends itself well to play and exploring the world around them. 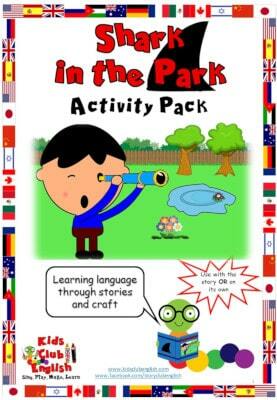 Our Shark int he Park Activity Pack is jam-packed full of printable, interactive crafts, games and worksheets that complement the story and help children acquire language in a fun and natural way. 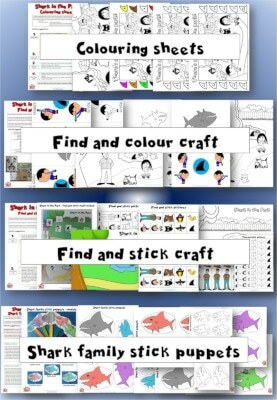 Detailed activity suggestions help you differentiate for age and ability.